← Wednesday 24th September 2014 – Only a short while. Thursday 25th September 2014 – Now that’s more like it. Today was a much better day than yesterday, in more ways that one. The weather was dry and sometimes sunny, so perfect weather for going to the allotment. I finished off the Onion bed that I had started the day before, but was so rudely interrupted by the rain, and then went on to turn over the bed where the Pumpkins had grown this year. The Pumpkins are still on my garden table, waiting ever so patiently to be carved very soon. Because this bed has had so much manure mixed with it, it’s still wonderful soil, so I don’t think I’ll have to manure this bed for a while. But I expect I’ll get some more manure delivered soon, and have it dumped on that bed so it will get a bit more. I then had some lunch, and then carried on for a bit longer. 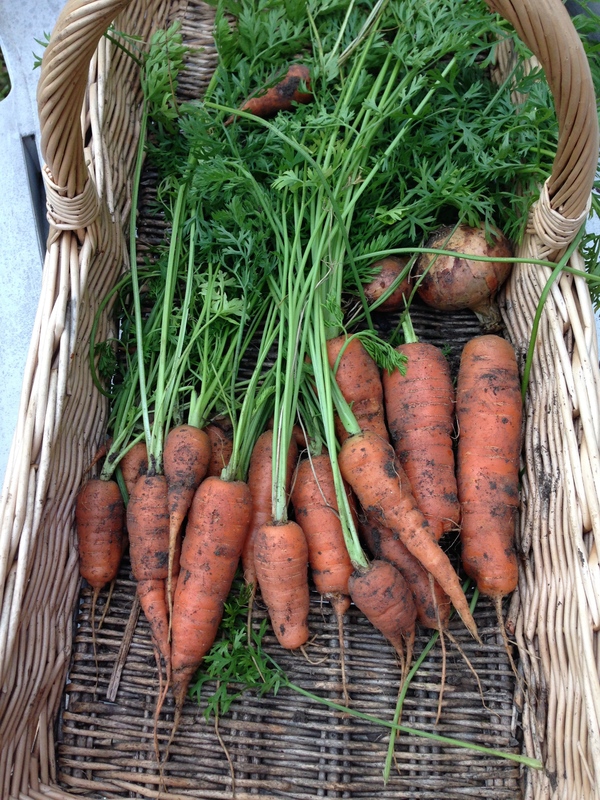 I also dug up some more Carrots. These were slow to start with, but once they got going they went full steam ahead. They look wonderful and I’m sure they will taste fabulous. A lovely selection of Carrots, with a couple of Onions that I’d missed. I also got bitten by a red ant again. The little bugger got stuck under my glove, and bit me really hard on my left wrist. It really stung for ages, and has now swollen up quite a lot. It’ll itch like mad tomorrow. This entry was posted in Uncategorized and tagged carrots, claire's allotment, onions, pumpkins. Bookmark the permalink.